You can use the projector's Quick Corner setting to correct the shape and size of an image that is unevenly rectangular on all sides. Note: To provide the best possible image quality, adjust the projector's position to correct the image shape. 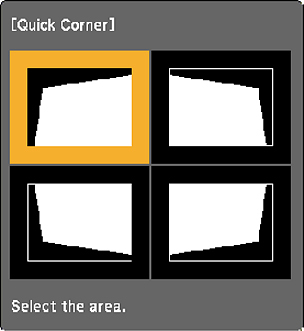 If this isn't possible, use the Quick Corner setting to correct the image shape. Note: You cannot combine Quick Corner correction with other image shape correction methods. Select the Settings menu and press Enter. 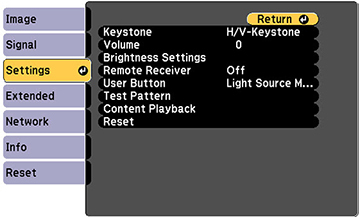 Select the Keystone setting and press Enter. Note: To reset your adjustments, press and hold the Esc button for at least 2 seconds to display a reset screen. Then select Yes. Use the arrow buttons on the remote control to select the corner of the image you want to adjust. Then press Enter ( ). Press the arrow buttons to adjust the image shape as necessary. Press Enter ( ) to return to the area selection screen.